The parable of the Prodigal Son has always been the parable with which I most resonate. In many ways it sums up my entire life as I am sure it does for others as well. In my earliest years I felt myself struggling to find my true identity as a child of God and in my struggle I rebelled against God, family, and church. When I began to make my peace with myself along with God, family and church in my late teens and early 20's I became more like the eldest son in this story- judgmental, self-righteous, and prideful. I had made my way back home while so many others had not. Wasn't I special or so I thought! As I have matured in my life and faith I hopefully have embraced more of the father's compassion, forgiveness, and celebratory nature while welcoming others back to their true identities as God's beloved children. As members of the Main Street UMC we have the privilege of welcoming others back home again after they have rejected their true identities as God's children. So many of the people we have gotten to know through Café Agape and other ministries of the church have struggled to embrace who they are and in their struggles have rejected God's love, mercy, and grace. We have the opportunity to help them to reclaim their true identities and to know once again that they are loved. We need to do this without judgement for the poor choices that have been made and the wayward paths that many have trod. We need to be more like the father than the eldest son and welcome back with open arms God's troubled, but beloved, children. May we continue to live into this parable as we welcome others back home to God and to themselves. It is what we are called to do. Theme: From the Pigsty to the Fatted Calf- In the parable of the Prodigal Son the youngest son's journey takes him from feeding pigs in a foreign land to eating the fatted calf at a celebration that his father insists on in order to welcome him back home. The images of food in this story symbolize the journey away from his true identity as the father's son to the reclaiming of that identity when the father welcomes him back home with open arms. We will explore how the food that we eat reflects our spiritual journeys with God and one another. At a recent Church Council meeting we talked about how we might better highlight some of the opportunities for service that are available through the church. A suggestion was made that maybe we could have an "opportunity of the week". This will now be a new feature in the weekly e-mail blast so look for these wonderful opportunities and see if there is something that sounds inviting to you. This week's opportunity is unchanged from last week since I had no responses. It involves volunteering to be a greeter coordinator or a greeter on Sunday morning. With our new entrances and different Sunday morning flow it is essential that we have more greeters than we have had in the past. It would help especially to have a volunteer to coordinate all of the volunteers. If you are interested in either- being a coordinator or a greeter please speak to Pastor Rich. Are you interested in becoming a member of the Main Street United Methodist Church? Would you like to know more about the United Methodist Church and the Main Street UMC? If so, please join Pastor Rich and others for two classes to be held at 9:00am on April 7th and 14th. The classes will meet in Pastor Rich's office. Please sign up on the sheet located under the clock in the vestry to indicate your interest. New members will be received into membership on Palm Sunday, April 14th during the 10:30am worship service. Following the Adult Sunday School class sessions on "Homosexuality and the United Methodist Church" and the outcome of the most recent special session of General Conference that not only reiterated our 47 year history of discrimination towards members of the LGBTQI community, but expanded punishments as well, interest was expressed in the possibility of the Main Street United Methodist Church becoming a Reconciling Congregation. A preliminary meeting was held on Tuesday, March 19th with nearly 40 individuals in attendance and the nearly unanimous decision was to move forward in exploring this option. A proposal was presented at the March 25th Church Council meeting which gave its approval for this on-going conversation. A planning meeting to discuss the process that we will follow is scheduled for Sunday, March 31st at 4:00pm on the second floor lobby. All are invited to attend. Just what is a Reconciling Congregation? 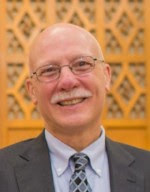 Simply put, "A Reconciling Congregation is a United Methodist local church that makes a public statement welcoming all persons, regardless of sexual orientation, to participate fully in their congregational life." At a time when the UMC has received extensive press for its discriminatory practices towards members of the LGBTQI community it seems more than ever to be necessary for United Methodist Churches to affirm themselves as safe and welcoming places for all God's children and especially for those who are actively discriminated against in the wider church. For more information about the Reconciling Congregation movement please check out the website, rmnetwork.org and look for written resources that will be made available as well. Please pray for our congregation as we go through this process, but most of all please pray for our LGBTQI sisters and brothers in our church and community who need to know that church is a safe place for them. When watching disaster unfold here or around the globe, many of us feel the call to help but are at a loss as to how. The United Methodist Committee on Relief does help, and UMCOR Sunday is our opportunity to support their efforts. 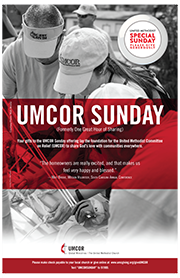 Your generosity covers UMCOR's operating budget so they can use 100% of donations received directly on relief efforts. Register by April 30, 2019, to guarantee a space on the Summer Mission Trip on July 14-20, 2019. Students who are currently enrolled in seventh grade through college are encouraged to participate in an exciting mission opportunity this summer. Our mission work will be hosted by the United Methodist Action Reach-out Mission by Youth (U.M. ARMY). This organization has been providing mission opportunities for youth and adults for 40 years. During the week of July 14-20, we will be partnering with several other UM churches to work in the Dover, NH community doing projects, such as handicap access ramps, step and stair repair, handrail installation, painting, yard work and a variety of other projects. The cost per person for this trip is $300. Due to various fundraising effort to help defray the individual cost for the trip, each participant will only pay for the $50 non-refundable registration fee. Simply use this Registration link: https://www.umarmy.net/Registration/Indv/3059/ to register for yourself. If you are under 18, you will need to have a parent complete the registration for you. At the end of the registration, you must download the Medical and Press Release Form, print and sign it. Once you have completed the registration, submit your Medical and Press Release Form and $50 non-refundable deposit to Karrie Lam, Coordinator of Youth Ministries. Checks should be made out to Main Street UMC with the words "Youth Mission Trip" in the memo.